Dealing with DM: The Good Fight | All Around Dogs Dealing with DM: The Good Fight | Thoughts on training and life with dogs. On December 10th, I attended a Brazilian Jiu Jitsu (BJJ) Black Belt test for the first time. The test ends with an exercise called the Shark Tank where the test taker is pitted against a “tank” of fresh opponents who come one after another in order of rank. It isn’t a test about being the best at BJJ. It isn’t about keeping up with fresh opponents for 4, 8, or 40 minutes. It’s a gut check – keeping fighting, don’t give in. Survive it with your attitude intact. As I watched the black belt shark tank wind towards the end – the test taker going up against the black belts – it hit me that this experience is an apt analogy for going up against DM. The DM shark tank is drawn out – the fight is daily, the duration is unknown. It starts out small, not so hard to adjust to. Getting tired a little quicker, more likely to slip or stumble. It wouldn’t be called easy but perhaps it’s harder to watch than it is to endure. The progression of symptoms is like the progression of the tank, with the increased experience of the opponents adding new layers of complexity and difficulty. The people on the sidelines can coach them and be supportive, but ultimately the dog must find a way through it on their own. At the end of this shark tank, there is no joy or pristine new belt to greet them. There are hugs and tears from those who loved them, those who are proud to see how hard they fought. But there is no “winning” against this disease. They can fight it but they cannot conquer it. At the black belt test I watched, the last person to enter the tank was the coach. The one who, aside from the student, had the most invested in the test. What he did to his student is violent but it was a necessary violence. A final push, a final response. The timer buzzed and the shark tank was over. Both of them were exhausted, spent, done. Dash’s shark tank is over. He’s shown us more heart than we could ask for, fought for over 13 months, pushed through for longer than any of us could have predicted. He is tired. We’re tired. On Wednesday, December 28th, we’ll give him his “reward” for enduring this disease – a death with dignity. We’re proud of you, Bubs. I am very sorry to hear that it is time. No one can understand it unless they have been through it. I know how tired Dash must be and you as well. We are. To the point where we have almost no will left ourselves. We are on our second DM ending – coming in maybe a few more weeks. My boy has made it for 15 months now and I know he would gladly keep going if I asked. But so many nights I have the familiar nightmares again, where I see him kidnapped, his useless legs keeping him from running, crying for me, but my legs are also unable to move. I wake up crying and run to find him, but then keep crying because, although he is not kidnapped, he IS being slowly taken and I can do nothing about it. This is the worst disease in the world and I am so, so sorry you and Dash have it. I am going to be actively thinking about you on the 28th. Any time you feel that catch in your heart, know that every other DM parent is with you. Thank you, FM. It’s heart wrenching how our minds can recreate our fears in such horribly accurate ways. I haven’t had any nightmares, but I did spend a long time staring at the ceiling last night as I thought about Dash’s arrival at my house today (my ex has had him for 11 days because I had minor surgery on the 15th). 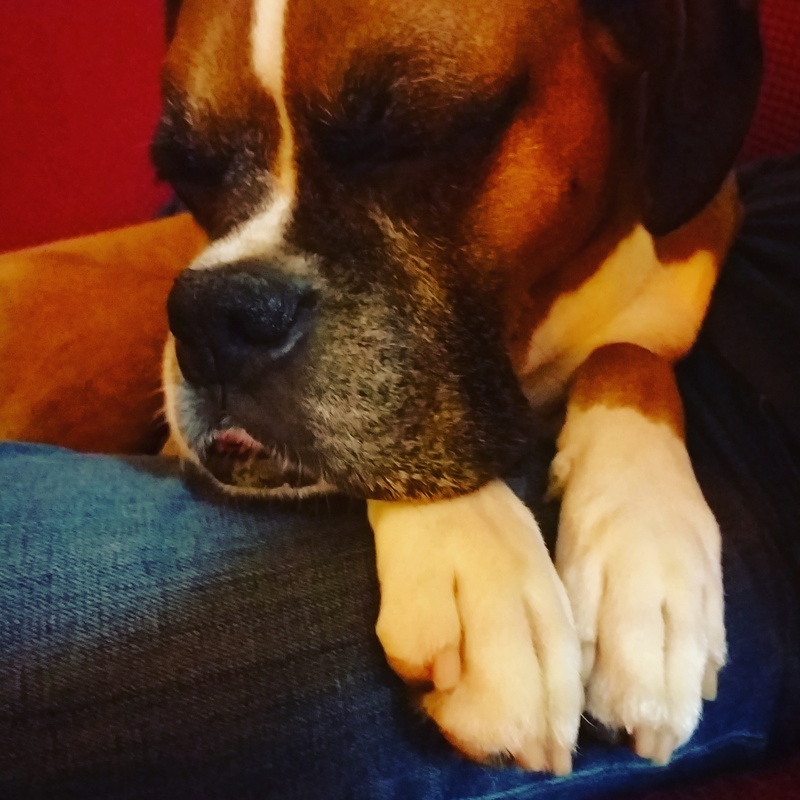 My first Boxer died quickly and unexpectedly of hemangiosarcoma, all of this time to think about the decision and the moment is agonizingly new to me.